If you missed out on the whole Homebase Black Friday sale last time round do not worry, because we here at BFUK will be providing you with all the upcoming deals every year from now on. If you live too far from a store do not panic because you can shop right here online, this is the only Homebase sales page you need for bargain updates. The Homebase online store will have many deals soon, and when they pop up we will be notifying you with them all here, as well as on our deals section, Facebook and Twitter. Homebase is great for customers looking for DIY tools, furniture, paint & decor, outdoor living, as well as bathrooms, gardening, kitchens and homewares. Take full advantage of Black Friday discounts at Homebase; trust us when we say you will not be disappointed. Here is a little history lesson, did you know the first ever Homebase store to open was in 1981 in Croydon on the Purley Way? The Homebase Black Friday hub can be found at their dedicated page, this is where all the deals will be listed. There are huge savings of up to half price off select paints at the moment. The brand is crown, which is very good indeed. Black Friday is on the 23rd November 2018 for Homebase. If you click the link above in the post you will be able to sign up to receive news of when it goes live. They have a Fathers Day hot deals on at the moment in store and online. Yes Joan, this is correct. They do this each year. When you click on the link within the post it goes to a normal page, but I am guessing when they annouce they are taking part they will make this page live, is this correct. How many people think that Homebase should do the 3 for 2 sale? Homebase has a huge £40 million clearance sale on at the moment, deals are in store only and whilst stocks last. 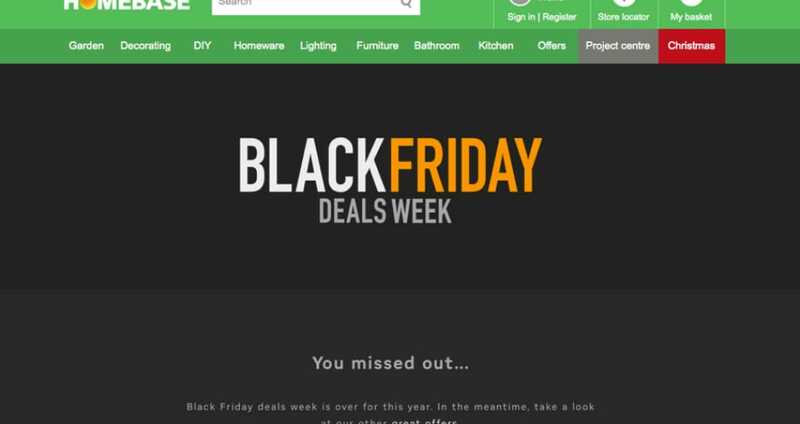 The Homebase Black Friday web page is still dated 2015, when are they going to update? They took part last year so I am guessing they will this year too. Has anyone come across any Homebase voucher codes for glitter paint for walls? I have always found Habitat items to be on the expensive side really, but I do like the cream Habitat Alto waste bin with lid at £35. Hombase have started The Habitat Sale where you can get up to 50% off. I really love the Habitat Concetta Dinner Plate with the 3 horses at £12, all prices are shown includes the discount. Was £89.99 but now only £69.99 for the 18V Stanley Fatmax Cordless Li-ion Hammer Drill. I just saved £40 on the Russell Hobbs Digital Grill Microwave. I thought it was only £10 saving when looked on the page but then saw it said £40 off because it was £84.99 then marked down to £54.99 and now i only paid £44.99. Save over £30 on the Vegas Lay-Z Spa, now only £249. I am so getting the 5 Piece Bonus Set boxes because i will save a cool £40.96, now just under £20 is what i will pay this is really good. Last year Homebase did a deals week, does this mean they will be having a deals week this year running from November 23 to 29, yes running the whole weekend as well? Please tell me they will sell complete kitchens with appliances under the Black Friday roof.